Stopped by Starbucks on way to work this morning to get this deal. I LOVE the Starbucks Christmas blend. Paid with my registered Starbucks card and got a free eggnog latte as well! 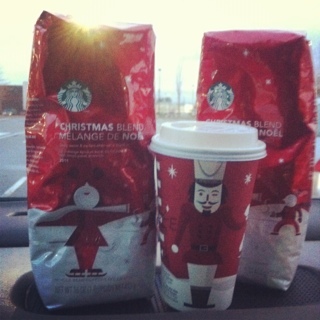 2 pounds of Starbucks Christmas blend and a grande (should of been tall) Eggnog Latte for $18.95! This entry was posted in b1g1, free, freebies and tagged b1g1, free, freebies, starbucks on December 29, 2011 by Courtnie.